Although some of you might consider starters as an optional course of the meal, nobody can deny the fact that they bring in an element of fun and excitement, and set the mood and pace for the upcoming meal. We might not plan to have starters for everyday meals, but any special occasion, be it a party or a festive celebration is absolutely incomplete without starters. Starters are meant to be visually and gastronomically appetizing. They are served with attractive garnishes and often with a selection of salads and chutneys. The splash of colours and the attractive forms in which the starters arrive make the diners eager to taste some! Starters must ideally be sized small and handy, so that it is easy to serve without fussing with forks and knives. Moreover, when multiple starters are served, a small sized serving ensures that the diners are able to taste all the starters comfortably without becoming full in the first course itself! Fortunately, starters need not always be complicated and time-consuming. Many starters can be prepared easily and quickly, with minimal ingredients. In fact, they must be kept simple and quick so that they can be prepared hot and fresh just before serving. Most starters will lose their vibrant colours and crispy textures when prepared earlier. So, pick starters that are simple to prepare yet tasty, like the ones shown here. Some starters are deep-fried, while others are baked. If you have somebody to help you, go for deep-fried starters. Else, if you are hosting a small party alone, pick baked ones, so that you can pop them into the oven and get ready to welcome your guests. When they are settled, the starters will also be ready. 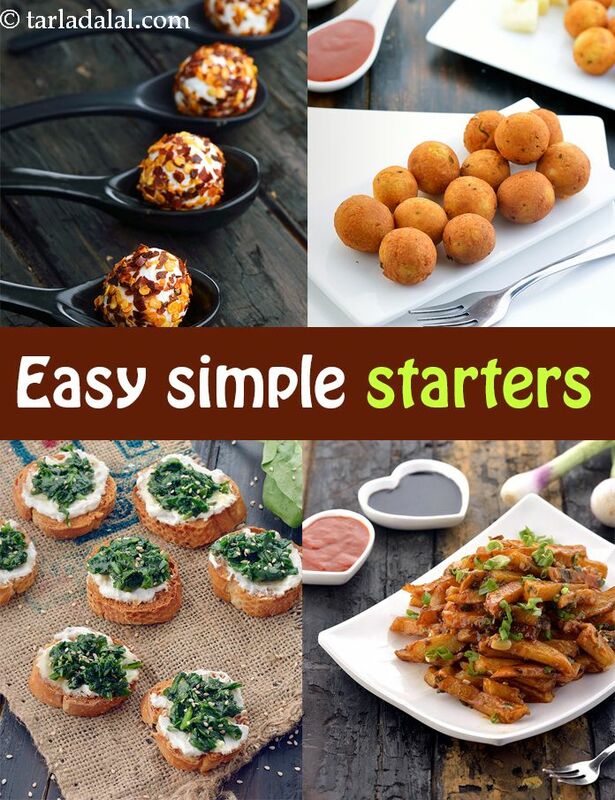 Cheese Balls, Corn Cheese Balls, Cheese Garlic Bread and Crispy Fried Corn are some of the all-time favourite starters, which are very popular in restaurants too. They can even be made on a Sunday to the utter delight of your family! Avocado and Coconut Crostini, Grilled Baingan in Olive Oil and Sea Salt, and Ricotta and Spinach Crostini are some elegant starters that’ll go well with any group of guests. For those who prefer a touch of desi spices, go for something like the Malai Paneer Chilli Flake Balls, Sprouts Tikki or Paneer Cheese Balls. And, for Oriental cuisine fans, there is nothing better than Chilli Potatoes and Gobi Manchurian, or the more exotic ones like Cauliflower in Schezuan Sauce. Take your pick of starters depending on the number of guests (whether for your family alone or for a larger party), the meal it is for, the age group and known preferences of the guests, time on hand, availability of help, etc. You can also customise the starters according to your preferences, by altering the spice levels, garnishes, veggies used, etc. There are many more options on our website and app, please do check them out.